Editor’s Note 5/18/11: Check with Sherman Preservation League, the Denison Service League and tourist offices in both cities to see when other tours similar to this one are scheduled. This spring will offer a rare opportunity to tour homes and commercial buildings with some of the richest architectural history in Texoma. Sponsored by the Sherman Preservation League and the Denison Service League, the tours will connect with the past and show how the past is moving into the present. In Sherman, on April 18, seven historic homes, some familiar and some new to the tour, will be open to visitors on the Preservation League’s Tour of Homes. Houses include the Josh Martin home on Birge, the Greg Connell home on Highland, the Tom Shields home on Willow, the Jason Sofey home on Preston (the last two were featured in the fall 2008 issue of Texoma Living! ), the Boiler Room Coffee Bar, the Talmage Nix home on Hopson, and the C.S. Roberts House and Museum on Crockett Street. Also on the tour is the Touch of Class Antique Mall Museum, with interesting artifacts and exhibits. This year’s event will feature local art, jewelry, food and wine vendors, and music at many of the tour stops. At the C.S. Roberts House, the league will present storytelling, soap making, and quilting. Refreshments will be available. 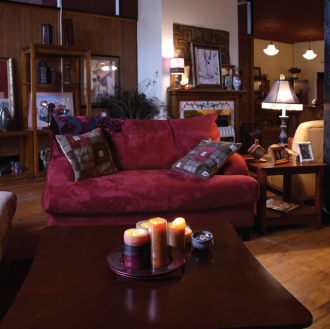 In Denison, on March 28, a Loft Tour will take attendees through seven loft apartments downtown. Some are hip and contemporary, while others are quirky and eclectic. Residents have responded to existing architectural situations in some creative ways, working to preserve historic integrity while integrating requirements for a modern lifestyle. In a loft over the former S&H Kress Building (now the Blue Moon Antique Mall), residents have converted a former candy storage space (complete with wire mesh to keep out the rats) into an art studio. The large, open floor plan is appointed with modern furniture and combines all the comforts of home with the “hipness” of an urban loft. The best part— there is no lawn to mow. This year’s loft tourists will also have the option of attending a grand VIP Reception at the historic Denison Hotel (formerly the Hotel Simpson) on March 27. This seven-story concrete tower is not only the tallest structure on the Denison skyline, but is the tallest building between the Metroplex and Oklahoma City. It’s now an apartment building, and guests have many surprises in store for them as they tour areas of the hotel that few current Denison residents have ever seen.